Foremost digital television company, StarTimes has launched the first of its kind 2-in-1 combo decoder in Nigeria, in an unprecedented move to change the Pay TV landscape in Africa and offer surplus entertainment access to subscribers. 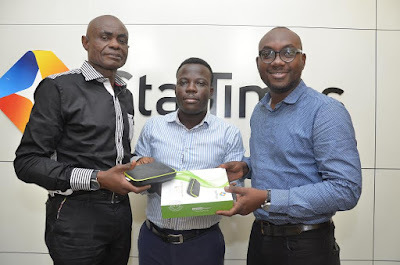 Marketing Director, StarTimes Nigeria, Mr. Oludare Kafar while unveiling the new decoder in Lagos, said, the 2-in-1 combo decoder is a game changing product from StarTimes and it was deliberately designed with latest global technology to lavish subscribers with unprecedented access to digital television and entertainment. Interestingly, this new combo decoder works with both antenna and dish and offers channels on both for the price of one. It also grants our esteemed customers access to over 100 channels across the genres with an enhanced high definition (HD) picture quality. Kafar noted that the digital television companys desire is to offer multiple access to subscribers to enjoy both digital terrestrial and digital satellite television channels and offerings on the same decoder and grant ease of access to switch between the options conveniently because our customers deserve utmost comfort and convenience. We strive to ensure that with a single decoder customer enjoys access to all digital television channels and contents available and this new decoder is expected to replace the traditional single decoder model. By default, both the DTT and DTH has comparative advantages but with combo, StarTimes subscribers enjoys the combined strength of both. DTT is embraced as a model for its affordability, low weather interference, portability, more local channels, easy to set up and mobile friendly while DTH is desired for its sharper and clearer images, higher number of international channels, resilience and widespread strength in remote areas. Mr. Israel Bolaji, StarTimes Head of Public Relations, added that StarTimes will continue to offer subscribers the best in class of pay TV experience with world class channels for drama, sports, kiddies, news, music and religion. We are keen to continuously enhance access and improve digital television experience for our subscribers. As a digital TV company, StarTimes desire and commitment is to ensure Nigerians continue to enjoy the best of digital television entertainment and experience with a plethora of enjoyable programs in higher definition (HD) images at very pocket-friendly bouquet rates. On StarTimes, Nigerians can enjoy fantastic movie channels like ST Yoruba, irokoworld, irokoplay Amc movies, ST Zone, Orisun, ST Yoruba, and Bollywood channels like Star Plus and Zee Cinema. Music channels like ST music, Nigezie and MTV Base; documentary channels like IDX, Nat Geo Gold and Discovery science; news channels - Al Jazeera and Bloomberg; ST Novela, Wazobia, Fox; Jim Jam, Nickelodeon, Baby TV, Fine Living and many more, Bolaji concluded.